How to choose correct 15V 3A ac adapter? 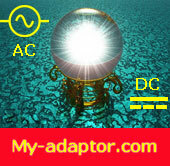 Choose 15V 3A ac adapter by brand you like. Note: this adapter have not US-wall-plug, you have to use with power cable.